Evgeny is a Russian Arctic ornithologist and conservationists, who graduated as a biogeographer from Moscow State University in 1985. Since then, he has taken part in tundra expeditions every year, and over the last 17 years, has focused on the most threatened birds in the East Asian Australasian Flyway. He initiated spoon-billed sandpiper conservation work on the Chukotka breeding grounds in 2000, which led to the development of the wider international effort and the establishment of the EAAFP Spoon-billed Sandpiper Task Force, which he currently chairs as EAAFP representative for Russia. Evgeny has participated in surveys of spoon-billed sandpiper staging and wintering sites in Kamchatka, Myanmar, India, Thailand, Vietnam and China. Evgeny is leading spoon-billed sandpiper conservation work in Russia, including organising regular BirdsRussia expeditions to Meinypil’gyno and assisting and encouraging spoon-billed sandpiper conservation work on the flyway with particular attention to Russia-China intergovernmental work on bird conservation. He serves as the head of the Russian Scientific Advisory Team for the Russia-China bilateral agreement. 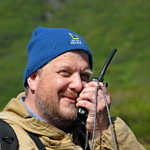 Evgeny also chairs the Arctic Migratory Bird Initiative (AMBI), a project of the Conservation of Arctic Flora and Fauna (CAFF) working group of the Arctic Council. AMBI has selected the spoon-billed sandpiper as a flagship species for the conservation of Arctic birds in Asia and works in cooperation with the governments of spoon-billed sandpiper range countries.